Running a Safer Sleep Week campaign in your area is an effective way to raise awareness of SIDS and equip parents with information on how they can reduce the risk. Set up a Safer Sleep Week 2018 committee and plan your activities now! We have a range of resources to help you with your campaign including display packs and free Safer Sleep Week cards and publications, which are available to order from our shop. The aim of Safer Sleep Week is to reach as many parents as possible with our safer sleep advice but we need your help! Simply sharing our posts on Facebook and Twitter using our hashtag#safersleepweek and sharing our free online Safer Sleep resources can help us to achieve this. During last year’s campaign we reached millions of people on social media alone. 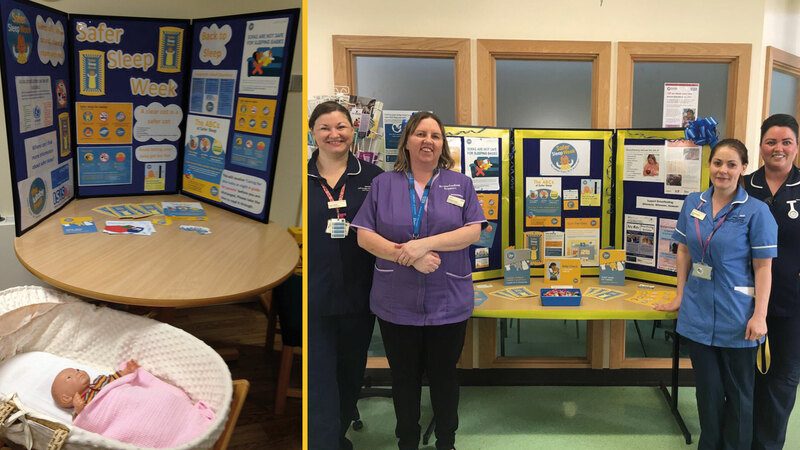 Ask your local authority to join the campaign and order our display pack and free Safer Sleep Week leaflets for new parents and anyone involved in the care of a baby. Use your Safer Sleep Week materials to create a display of our important advice and pop your collection box nearby so that passers-by can donate easily. Organising a bake sale or coffee morning in your local community or workplace is easy on the pocket, and fun to do. With nothing more than small team of people, dedication and some planning and baking, you can have a successful event of your own! When you are ready to pay in your funds please visit: lullabytrust.org.uk/support-us/donate/donate-by-post-or-by-phone. Share our Text to donate code which is: ‘Text SSWE00 £5 to 70070’ with all your friends, family and those in your local community. Every donation will go towards our Safer Sleek Week campaign. Safer Sleep Week takes place 12th- 18th March 2018. Please register your interest in fundraising for Safer Sleep Week 2018 by filling in the form below or by contacting fundraising@lullabytrust.org.uk/ 0207 8023210. At The Lullaby Trust, we’re determined to do all we can to save more lives. We can’t do this without the help of our supporters, which is why we’d like to keep in touch with you about our vital work, news and opportunities to support us. You can change the way you hear from us at any time by emailing office@lullabytrust.org.uk or calling 020 7802 3200.